January is the month that many are setting goals, and making resolutions for the year. Often the idea is to eliminate a bad habit and/or start a new habit. According to statistics most of these fall by the wayside before March. I don’t say that to discourage you but to emphasize the importance of not giving up on your goals. If you fail to maintain your new habit simply start over regardless of the date on the calendar. This year I’m setting out to re-establish a great habit that I had years ago. Even after a habit is solidly established it can still be easily lost if it is not maintained. The habit I want to start again is daily journal writing. In hopes of strengthening my commitment, I bought a very nice refillable journal. Sharing your goals can help you become more solidly committed to making it happen. I look forward to reading about your goals in the comments below! We turned our clocks back one hour this past weekend. I love it when we Fall back into Standard Time! So apparently I had some type of 24-hour virus. Once I returned to feeling normal, it didn’t seem like normal anymore. No longer being sick seemed marvelous! Each ordinary day this week, after Monday, there has seemed to be so much to notice and appreciate. I am sure you’ve had this same experience after a bout of sickness or pain. This happens because returning to a life free of sickness, pain or _____causes fresh appreciation and a feeling of true gratitude. When we are living in a state of appreciation and thankfulness we are seeing things clearly. If only we could continue in this attitude but it always seems to wear off quickly. Take a look at the definitions below. Since we are only two weeks away from Thanksgiving I am hopeful that I might be able to maintain this attitude. I would love to live with thankfulness, wonder, gratitude and fully appreciating every single day. The only way I believe to make this happen is to ask Jesus to make me more aware of His Presence with me as I read His Word each day. What could inspire more of an attitude of appreciation and joyful thankfulness than knowing I am invited to walk through each and every day with the King! And so are you! I am praying that this Thanksgiving season we will not be satisfied to be thankful for a day but will pursue a lifestyle of thankfulness and appreciation that spills over wherever we go. “I am the true vine, and My Father is the vinedresser. Every branch in Me that does not bear fruit He takes away; and every branch that bears fruit He prunes, that it may bear more fruit. You are already clean because of the word which I have spoken to you. Abide in Me, and I in you. As the branch cannot bear fruit of itself, unless it abides in the vine, neither can you, unless you abide in Me. “I am the vine, you are the branches. He who abides in Me, and I in him, bears much fruit; for without Me you can do nothing. If anyone does not abide in Me, he is cast out as a branch and is withered; and they gather them and throw them into the fire, and they are burned. If you abide in Me, and My words abide in you, you will ask what you desire, and it shall be done for you. By this My Father is glorified, that you bear much fruit; so you will be My disciples. So much in this portion of scripture to study and apply to our lives. Jesus is speaking to us as much today as He was when He said those words to the disciples. If and only if we are truly abiding in the Vine will there be fruit to bear. Notice we do not make the fruit but we are bearing the fruit. I like to think of this as the fact that as branches we are displaying or holding the fruit. I picture anything that has the purpose of displaying something else. When you look at a vine full of fruit you will notice the fruit, not the branch that is holding the fruit. Keeping this in mind should help us be quick to give all glory to God. Let’s live each day seeking to bring attention to Jesus, not ourselves. 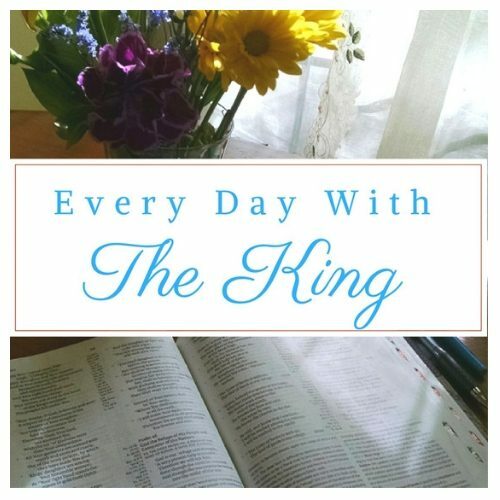 If you have read only a few posts here on Every Day with the King, you surely know there are no subjects mentioned more than starting your day with Jesus and Bible studies. Today I would like to suggest an option that is designed for when you have very little time and yet is very adaptable for when you have more time. So whether you have 5 minutes or 30, this is designed to fit your life. If you are not familiar with First 5, please take the time to check it out. The app is free. Join and get started today. You will find the daily reading each morning on the app. If you want to order the Experience guide you will find lots of material to expand your study. The guide is completely optional. The app includes many features to explore. Past studies are always accessible along with the current study. You can comment and be involved at what level is best for you. There are community groups. These are groups where you can meet to discuss the study right there on the app. The First 5 studies are extremely well written and presented. My favorite thing about First 5 is that it is designed to make everything about starting your day with Jesus so simple! Check out the First 5 Help Page to find so much more information. Have you experienced First 5? I could keep adding to the list but I’m sure you get the idea of what I’m talking about. We seem to be drowning in too much everything! It is the cause of a huge amount of the stress people have come to accept as normal. Recently this overload has been recognized as the cause of terrible stress, resulting in poor physical and mental health. One of the biggest problems is the overload of social media. Are smartphones really a smart idea? Great that the problem has been identified. Next comes the challenge of what to do about it. It is pretty easy to find some help today. There are books, articles, videos, even entire websites devoted to returning to a simpler lifestyle. You will easily find much on the subject of living better with less, minimalism, and many practical tips to make much-needed changes. However, I do not think we have explored the problem from the Christian perspective. Many of us are living with an overload in areas like Bible study, prayer, Church activities… There is a constant flood of information, too many choices, and excessive social media options available to the believer today! The availability of all things “Christian” sounds good, but is it all too much? I think so. What do you think? The explosion of instantly available materials, social media and more in the Christian world has contributed to our loss of focus. We begin to drift from the simple basics of our faith. What comes to mind when you think of the word SIMPLE? Looking at definitions causes me to wonder why simple has been so undervalued. It seems that it should be especially desirable for followers of Jesus. Let’s take a look at a portion of scripture that might be helpful in understanding how we go off track. The manna looked like small coriander seeds, and it was pale yellow like gum resin. The people would go out and gather it from the ground. They made flour by grinding it with hand mills or pounding it in mortars. Then they boiled it in a pot and made it into flat cakes. These cakes tasted like pastries baked with olive oil. The manna came down on the camp with the dew during the night. How could it be that God’s provision of daily bread from heaven was not satisfying to the people? Manna was not good enough? These verses seem to indicate an influence from other people and a looking back at the world they left behind. God set these people apart but instead of praising God for His care they craved something more… Simple manna didn’t seem like enough. Today there is a call from the world to join in a quest for the latest new thing. The push is for constant updating. The result of this influence causes us to think we need to read the latest book, use the newest prayer model, follow the latest Christian social media, join multiple Bible studies… Meanwhile, maybe you never got around to just sitting down with Jesus and reading His word for you today. Sometimes what we need is to let some things go and cling to what truly matters. In 2 Corinthians 11:3 Paul warned against drifting from the simplicity that is in Christ. God’s word is never outdated. The Holy Spirit has a training course that is perfectly designed for you! Let’s listen to someone who never seemed to forget the power of the simple basics. Apparently, some are now debating if Billy Graham’s theology was too simple. What do you think? Who wants to join me in a return to the simple basics?